A garden was made near the village of Fin by Shah Abbas 1. Most of the present garden, which is in good condition, dates from the nineteenth century. 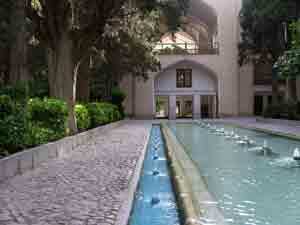 Approx 1.5 ha is enclosed by a high curtain wall with circular towers. Water is supplied by a spring and a qanat. The plan is a sophisticated charhar bagh with grids of canals and paths. 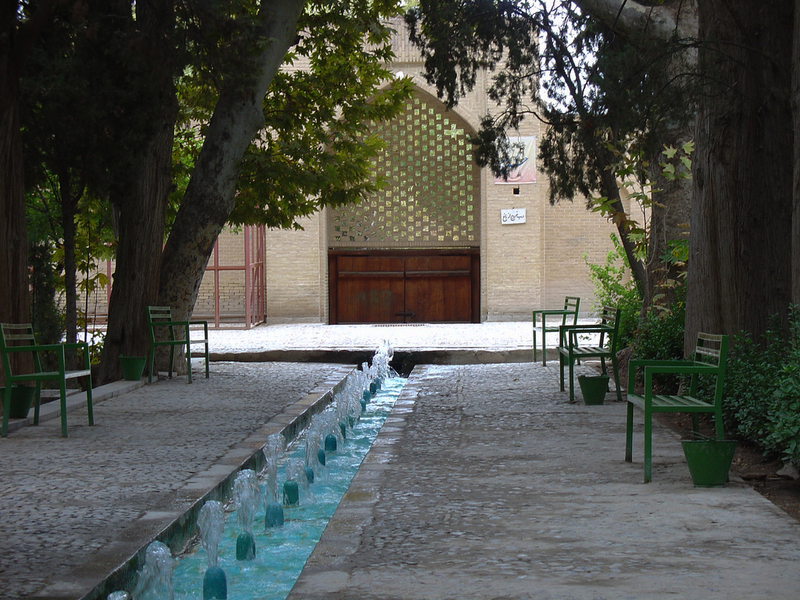 The canals are lined with blue-green tiles, a colour which contrasts wonderfully with the desert outside the garden walls. In her book on Gardens of Persia (2003, p 94), Penelope Hobhouse comments that the Fin garden can hold its own 'with the great gardens of the world'. But the Lonely Planet guide to Iran (2001, p 279) reports that some visitors are disappointed. The garden needs a restoration plan and could become a UNESCO World Heritage site. Donald Newton Wilber wrote (in Persian gardens and pavilions, 2nd edn 1979, p90): 'Fin merits close attention because it is an admirable example of the monumental royal garden, and because it is the very epitome of the Persian garden - this single example displaying all the most desired features and elements... The garden expresses a series of accentuared contrasts between the arid, inhospitable landscape outside the walls and the lush foliage within. Outside, water is scarce and precious; here it flows with superabundance to produce a dense jubgle of growth. The monotone of the landscape is replaced by the colors of foliage, of flowers, of blue tiles, of fountains, and of painted plaster and woodwork, Axial symmetry contrasts with areas of almost impenetrable growth. The plan of Fin calls sharply to mind the Persian garden carpet, for all elements of multiple channels, orchards, flowers, and pavilions are present in similar relationship. 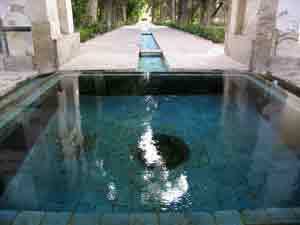 At Fin, all the channels are lined, sides and bottom, with blue faience tiles so that the very water seems bright and gay until it flows into one of the larger pools, lined with great trees. The largest pool mirrors the remains of the central pavilion, ascribed to Fath Ali Shah' The garden was repaired in 1935 and Wilber called for restoration of the central pavilion, which has seen been effected. [Note1: Don Wilber was a scholar, adventurer, spy, patriot and author of a book in Timurid architecture. He developed the plan and aided the execution of overthrewing the Government of Iran and placing the Shah on the throne. He recruited Ayatollah Kashani to help overthrow the Mosadegh Government of Iran in the CIA plot of 1953. The history books do not think well of his intervention - but he undoubtedly loved the history and culture of Persia].